The reader can’t see me, but I’m smiling indulgently. If he were to tour the basement computer room at our Kansas City headquarters, he’d see that less than half of its vast expanse is devoted to course rating. The white-coated technicians in the southeast corner work around the clock to crack the recipe for the no-longer-available Newly Weds Ice Cream Cake. The cubicled nerds in the center of the floor are trying to hack the Google search algorithm so that Tour Tempo 2: The Short Game and Beyond will be the default answer to all internet queries. And that windowed office with the shades pulled down? Let’s just say that you’d merely have to touch the doorknob to find yourself surrounded by NSA security types with weapons pointed at your head. But it was golf that lured me into the scientific community — specifically my ability to rate things associated with the ancient game. My latest project, funded by Golf Channel, is an authoritative ranking of the best golf shots in history, cumulatively and by category — i.e., best putts, best drives, best provisional drives, etc. We’re weeks away from releasing the initial rankings, but I peek at the data from time to time. These, I hasten to add, will be up-to-the-minute shot rankings. Last week, for instance, an American club pro cracked the Top 50 Sand Saves list. 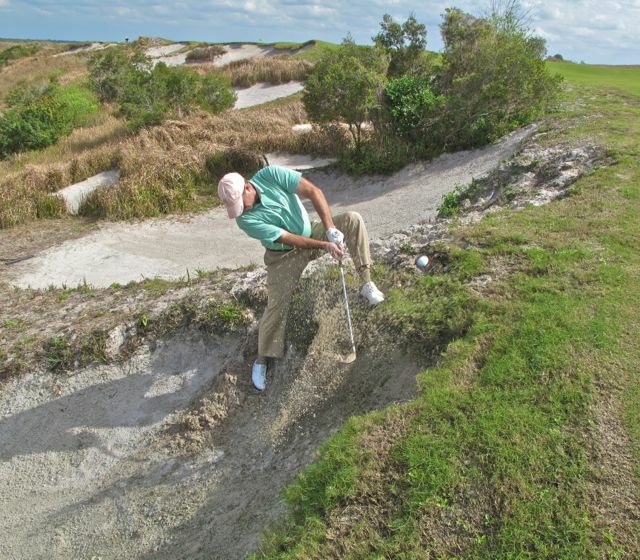 Playing in the prestigious Renaissance Cup at central Florida’s Streamsong Resort, Jim O’Neal got up and down from a buried lie beneath the lip of a greenside bunker on the fourth hole of the 48th-ranked Streamsong Blue course, a Tom Doak design. Hey, that’s how we operate here at Catch Basin. If our Montana reader wants us to put our technology to better use, he’ll have to show us how. Top 50 on TV: Nothing this week, but Gary Van Sickle, our chief course rater and award-winning PGA Tour correspondent, has filed this remarkable Golf.com feature from the Waste Management Phoenix Open at TPC Scottsdale. It’s about “the biggest hero at the Phoenix Open,” burn victim and scratch golfer Jason Schechterle, and it will blow your mind. Great work, Gary. That’s a mean shot from those bunkers short of the 4th, my favorite hole on the Blue Course at Streamsong….both to play and to photograph. Good job John and Jim!